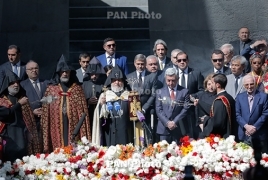 PanARMENIAN.Net - President Serzh Sargsyan and First Lady Rita Sargsyan on Sunday, April 24 visited Tsitsernakaberd the Armenian Genocide memorial to pay tribute to the victims of the Genocide. Sargsyan was accompanied by world-famous singer Charles Aznavour, actor George Clooney, Aurora Prize nominees and the Catholicos of All Armenians, His Holiness Karekin II. They laid flowers at the memorial, with the Catholicos praying for the innocent victims of the Genocide.